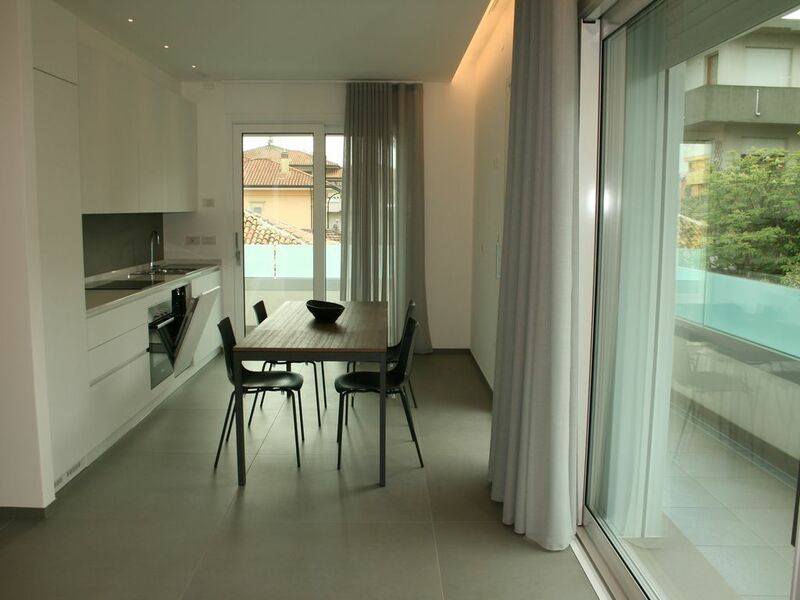 We rent an elegant 85 sqm apartment in a newly completed condominium. The property is located a few steps from the beach of Viserba, a quiet village in the hamlet of Rimini with some of the longest beaches on the Riviera. - 2 bathrooms, one with a bath and one with a shower box. Hairdryer included. - Living (sofa + TV 40 inches) with kitchen equipped with fridge, freezer, electric oven, induction fires and dishwasher, dishes and crockery. In addition, the structure is equipped with a large lift that gives quick access to the apartment. The house is located 3km from the new Rimini exhibition center and is therefore an ideal choice for those wishing to take part in the many events taking place throughout the year. Also remember that Rimini is sea, but also much more! And the reasons for a holiday in Rimini certainly do not end with the summer! The historic center, the reopening of the 800's theater after over 70 years, the restored Fulgor cinema (inserted by the New York Times among the 52 must-see destinations of the year), the hinterland with its villages, castles and food and wine tours provide an excellent starting point for an "alternative" holiday in Rimini to the unmissable stop on the beach. Ringrazio per l'ottima recensione, mi ha fatto molto piacere avervi come ospiti...vi aspetto a presto!! Comodo, confortevole, vicino al mare e soprattutto proprietaria gentilissima che ci ha accolto con una sorpresa culinaria. Grazie Andrea! Mi fa molto piacere che vi siate trovati bene nella mia casa. Spero davvero di rivedervi per il prossimo evento congressuale o per una bella vacanza! Appartamento stupendo, completamente nuovo e arredato con gusto. Ambienti spaziosi ed ampio garage dove è stato possibile parcheggiare 2 auto. A due passi dal mare, da bar e ristoranti ed a pochi minuti dal centro di Rimini; posizione decisamente comoda. La ciliegina sulla torta è l'accoglienza di Antonella, sempre gentile e disponibile. Ringrazio per l'eccellente recensione che hai fatto su di me e sulla mia casa vacanze...sarà un piacere ospitarti quando ritornerai a Rimini. Appartamento nuovo e dotato di tutti i comfort. Antonella, la proprietaria, sempre gentile e disponibile. Posizione vicino al mare. Consiglio vivamente. Ringrazio per l'eccellente recensione che mi avete fatto, è un piacere potervi ospitare per quando vorrete ritornare a Rimini. Super séjour dans un appartement magnifique , à 2 pas de la mer . Merci Antonella vs êtes une hote très agréable et vos gâteaux sont succulent . Si nous revenons un jour sur Rimini nous viendrons chez vous . Merci beaucoup pour l'excellente critique. The apartment is located on the first floor of a building just completed a few steps from the sea of ​​Viserba, a quiet seaside resort with the longest beaches of the Rimini Riviera. On the seafront buses run regularly and quickly connect Rimini (center less than 3km), Riccione, Bellaria and the new exhibition complex (c2km). The center of Rimini, too often underestimated, has recently been the subject of a profound urban redevelopment, aimed at making the historic city shine with its legacies from the Roman and medieval periods. If you would like to enjoy the Romagna countryside, we recommend the discovery of Santarcangelo, an elegant village where you can dine in excellent restaurants among cellars and tufaceous caves. We also recommend a visit to the many medieval fortresses in the area, from San Leo and the prisons of Cagliostro to Montebello with the ghost of Azzurrina. Not to be missed are the numerous parks of the Riviera, from very close Italy in Miniature, up to Oltremare, Fiabilandia, Mirabilandia and Acquafan, all easily accessible by public transport or car.